An unparalleled programme of inspiring thought leadership presentations, informative best practice case studies and engaging panel discussions will take place throughout ISE 2019 on the Main Stage in Hall 8. All sessions are free to attend and no advance booking is required. Over the four days of the show, more than 70 industry luminaries will take to the Main Stage (Stand 8-E400) to share their knowledge with ISE attendees. The content has been produced by AVIXA, CEDIA, ISE and media partner AV Magazine. The Main Stage has been specially designed by ISE partner Improve; featuring LED displays around the top of its perimeter, it will be a prominent landmark in Hall 8. AVIXA’s Main Stage sessions will focus on creating exceptional experiences, with systems integrators Amptown System Company, Kraftwerk Living Technologies and TRISON sharing insights on recent outstanding projects. Additionally, the association will provide compelling guidance on a range of important industry topics including how to identify, hire and motivate staff; the practical benefits of CTS and other AVIXA certifications; and the vital role of AVIXA standards in ensuring the successful delivery of projects. CEDIA is presenting a fascinating insight into what it takes to deliver winning projects. Winners of the EMEA CEDIA Awards will describe their projects, outline the challenges they overcame, the decisions they took and how they approached the creation of an outstanding installation. The featured projects take in creating the ultimate home cinema, equipping luxury apartments in London’s Mayfair, creating an enticing showroom, and automating modern homes. Integrators presenting their work will include Archimedia, Cornflake, Henri and Ultamation. ISE’s own sessions on the Main Stage are curated by Smart Building Conference Chair Bob Snyder. Featuring leading technologists, consultants and business leaders, they will explore and debate some of the key technology issues and trends affecting the industry. These include smart building (three sessions), digital signage, immersive environments, “as-a-service” offerings, eSports, virtual/augmented reality and blockchain. AV Magazine has assembled an impressive array of high-profile industry experts for its panel discussions and case study presentations. 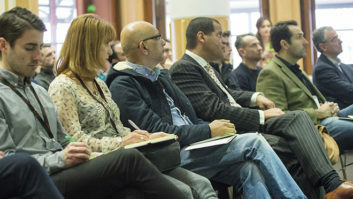 Among the topics to be debated are: the role of AV technology in creating and delivering immersive visitor experiences; the challenges of achieving diversity in the AV industry; market-disrupting technologies, such as XR and holography, and the opportunities they provide for solution differentiation; the impact of spectrum changes on the audio industry; and the future of AV in the workplace. Also on the AV Magazine programme will be absorbing case studies, including two major projection mapping projects: one that marked the centenary of Passchendaele, the third battle of Ypres, and another centring on the tallest statue in the world. At 16:30 on Thursday 7 February, ISE’s Stand Design Awards will take place. The Awards recognise the most effective stands on the ISE show floor in four size categories. The event is organised independently of ISE by EXHIBITOR magazine, which visits every ISE stand to compile a shortlist; the winners are judged by a panel of design and exhibition professionals.